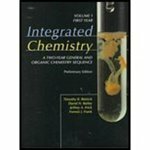 "Integrated Chemistry: A Two-year General And Organic Chemistry Sequenc" by Timothy R. Rettich, David N. Bailey et al. This two-volume series represents a course sequence that explicitly addresses the needs and special interests of biology majors and premed students. By presenting organic chemistry earlier in the curriculum, the Integrated Chemistry series demonstrates the connection of this material to other fields of study. Rettich, Timothy R.; Bailey, David N.; Frick, Jeffrey; and Frank, Forrest J., "Integrated Chemistry: A Two-year General And Organic Chemistry Sequence, Preliminary Edition: Volume 1, First Year" (1999). IWU Authors Bookshelf. 41.